Do you have any idea how many smartphone apps there are available to download? Okay, I’ll help you – a ton. The Apple App Store alone offers roughly 2 million. Now that’s great for doing all sorts of things on the go – from playing games, looking up words in a foreign language or even paying for your groceries. But let’s face it – flipping from one app to another gets old after awhile. Which probably explains the recent interest in linking apps together with automation tools like Microsoft’s Flow, IFTTP or Zapier. The conclusion is simple: consolidation and integration are the name of the game. Now take a look at this graphic – the famous MarTech landscape by Scott Brinker – presenting the many platforms and solutions available for marketers and advertisers. Yes…that’s a lot. Over 3,500 unique vendors of advertising and marketing technology to be exact. And what is more – an 87% increase over 2015. Now that might be great for startups and innovators – but just like smartphone users, AdTech and MarTech users are having a harder and harder time keeping up with the vast array of tools available. One application for content management, another for analytics, a different tool for tag management, a separate platform for optimization. Before you know it, you have as many tools to run your marketing campaigns as you have apps on your iPhone! This fact alone might be enough to push some clients to look for an “all-in-one” solution. But there are actually more reasons that full stack solutions are on the rise for advertising and marketing. Data comes in many shapes and sizes – but the king of data (when it comes to value) is the first-party variety. First of all, it is the most relevant to brands. It also tends to be the most accurate – collected directly from/about the data subjects themselves. Also because it is taken “straight from the source” marketers can ask for and receive permission for its use – something that is harder to do with second- or third-party data. First-party data has a full range of benefits for businesses. The only problem with first-party data is that it is more labor-intensive to gather and use. digital tracking (including cookies or Universal Identifier). Now – add the fact that each player in this game is using a different platform and the plot begins to thicken significantly. Then there is actually using that data. How do you put it all together? Where do you send it to activate it and reach your target audience? The whole idea of data silos – a term bandied about a lot these days – becomes a very stark reality. Implementing a full marketing stack can alleviate the situation and make the entire process of exploiting first-party data a lot smoother. You add a new product line to your website. Your marketing team will use a tag management system (TMS) to facilitate data collection about site visitor engagement. That info will need to be dropped into your analytics tool where your web analyst will filter it and segment it. Now you might want to use those segments to run a display ad campaign based on the most popular items in this new line. But you want to target a certain demographic group with this campaign. For this you’ll need to sync your analytics segments with your data management platform which can then activate them by connecting with a DSP such as AppNexus. But then – after you run the campaign – you want to take the data you collected about conversions, impressions and run it back through your analytics tool (and, by the way, those conversions will be tracked with the help of tags and impression pixels) in order to be able to optimize your site and product offering. That’s a lot of data flowing around! While you might be able to get all that done using a handful of separate platforms – a full marketing stack, helps to collect & organize the data, push it to different tools, run & optimize the campaigns, provide centralized reporting would certainly make the job a lot easier. With so much data flowing around, data privacy compliance becomes a major issue. First of all, data subjects must declare clearly that they agree to their information being used for marketing and advertising purposes. They also have the right to withdraw that consent at any time. If a marketing team is using a bunch of different applications – for tag management, analytics, conversion tracking, etc. it becomes pretty hard to keep track of what information can be used for what purpose, which can be shared with which tool, which platform meets the standards of U.S. regulators and which meets both U.S. and European requirements. Some tools, like Piwik PRO Tag Manager offer blanket data privacy compliance for all tags. 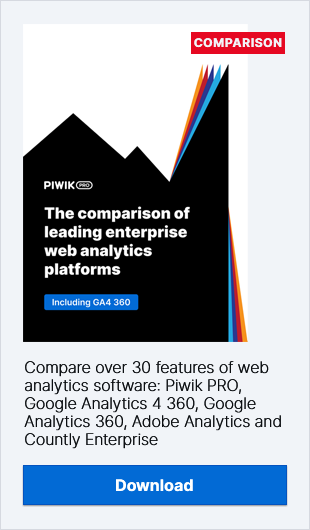 Which is a great feature – but what happens when you try to put it together with some other analytics platform that doesn’t give you full control of your data? What happens when a customer decides that he or she no longer wants to receive marketing materials or – even more seriously – wants to have their data deleted based on “Right to be Forgotten” laws? By implementing a complete suite of tools, marketing teams can keep tabs on all the data being collected about customers and in the case of an opt-out from receiving marketing materials by a particular customer, it’s only a matter of a simple click and it’s done. Contrast that with the hassle of having to track down a client in your email marketing platform, in your analytics tool, in your CRM database…you get the picture. There is one more, even more practical reason for getting away from a fragmented set of marketing applications and using a full marketing stack. It’s called agile marketing. More and more brands are building campaigns, optimizing them and checking results at faster and faster paces. The principles of agile marketing – much like lean or “just-in-time” principles in manufacturing and agile software development – emphasise reduced waste, small iterations and rapid reaction to changing needs and trends. This means they need more streamlined workflows, better cooperation and quicker insights. And this is often what is lacking when brands work with marketing and advertising agencies. The desire to become more independent – both from agencies and from a company’s own IT department – also provides a strong motivation for implementing a full marketing stack. No more waiting around for developers to implement new tags on a website, deliver data from a recent campaign or for an agency to report on ad impressions served. A clothing brand might prepare a seasonal promotion of winter coats – only to realize that the weather in their primary market is warmer than usual, meaning there is less demand. But thanks to insights from their integrated, data-driven marketing platform, the brand might be able to determine that a certain demographic group – more affluent, returning customers – demonstrated particularly high engagement with the campaign. The brand concludes that this target group – with more money to travel – is still interested in this product line because they will travel to other countries for ski holidays. Armed with this information, the brand’s marketing team could then quickly shift the campaign’s focus to this one particular group and optimize their product offerings aimed at other target audiences. Another example could be some PR scandal of a competitor (think Samsung’s Galaxy Note 7 troubles) or a piece of hot news (weather, political, etc.) that a brand wants to take advantage of. While using a stack might have minimal effect on the time it takes to create the campaign, it will make it significantly easier to target it, optimize it across multiple channels – all tasks that would take a lot of time using multiple separate tools. So to be truly agile, marketing teams will want to use as few tools as possible in order to be able to act with maximum speed. Going back to the world of smartphone apps – it’s not hard to imagine more and more integration and cooperation between them. The same is sure to happen among the more than 3,000 marketing technology vendors. But just like the earth’s crust, where tectonic plates meet, there tends to be friction, and sometimes things even blow up. So even though vendors may strive hard to integrate their platforms with each other – there will never be as complete integration as there is in a full marketing stack.